Earlier this week we informed you all that we intended to perform a major server upgrade in preparation for E3. Despite complications in the process, we are pleased to report that our server technicians have successfully put the finishing touches on their work. We are now officially up and running on the new architecture! We'd like to congratulate the team on completing what has been a months long project and implementing it without significant downtime. Today we are also releasing a separate minor point update to the new DayEra and NightEra themes. In response to the most common point of criticism, the colors on NightEra have been adjusted for more comfortable viewing, and a lot of work has been done under the hood to improve efficiency. Aside from that, this is largely a stability and bug fix update. We'd like to thank both teams for their hard work as we continue our march towards E3. Much better on Android with small scaling! Congrats on finishing the update. Here's hoping everything works smoothly during the apocalypse later this month. This place is a joy to visit! Has the update to NightEra been applied because to me the colours are still hella harsh and intense. Dark Theme legacy will always be around right? Night Era is just too bright of a purple for me. Everythnig else is nice but no SNES purple is a no go. Why not have the symbols that we already have to distingush from read/unread? It's still hard for me to see the difference in the new designs. Is the width issue seriously not going to be addressed? Maybe for 2.0? I'm excited to see if the forum will be able to handle its first major stress test. I'm not sure if NeoGAF always died because the traffic was really that intense, or because the site's owner was just super-cheap about upgrading servers and software. Appreciate your work everyone, even when it goes unseen. With NightEra and DayEra, the transparency the transparency in avatars is still a little funky. Looks like they have a border in DayEra: is this a design choice? Best of luck for E3 guys and gals! Thanks for the server upgrade! Can't wait for E3! We still gunna crash the site tho. Like just promise me DarkEra legacy will never go away. Great, this E3 is gonna lit. Thanks for all the work on the site! Edit: Looking back at my previous posts this is actually a slight improvement, however, it's still obviously not at all ideal. 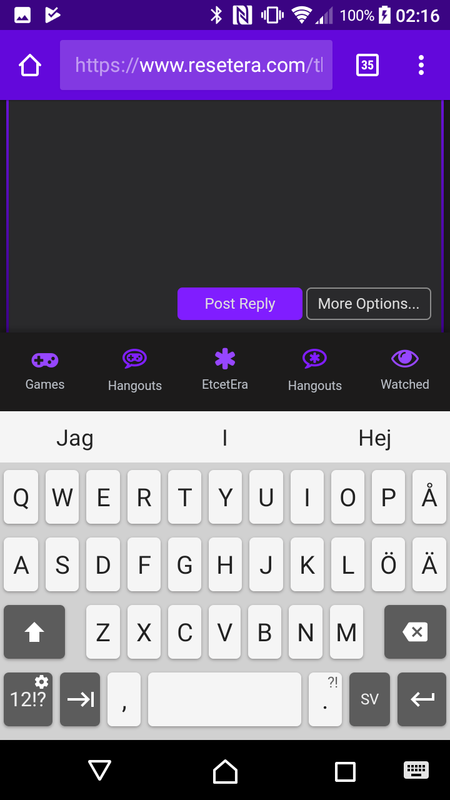 one issue i have with night era on mobile is the position of the forum jump button just above the keyboard. see screenshot below. it's quite easy to accidentally press these and lose the post you've been typing up. is this in the pipeline to be changed? Awesome work, guys. You're gonna make me switch to NightERA...looks so good. Great stability update. Good to have before E3. NightEra looks the same to me, still that painfully vibrant bluish purple. NightEra looks a lot better now colour wise but I'm not sure why there's so much unused space on the page. Will stick with DarkEra for a while longer. This. I honestly don't get why the DarkERA layout didn't get copied onto the new NightERA framework. Why change a palette that's already perfect? Margins are still kinda wonky on day? Server upgrade is smart. This site is going to get smashed during E3. We believe we have a solution for everyone on the width issue, but we're saving that for 1.5 to run more tests and ensure stability. For as long as DayEra/NightEra are around. LightEra legacy is where I will stay. Great work E3 server team. Night Era purple is still too eye searing for me. I don't notice any difference from before. Back to DarkEra Legacy I go. Dark Era coloring and font boldness applied to Night Era layout would make me switch. Is the incorrect site design selection (ie: mobile vs tablet vs desktop sites) being looked at? Seconded. NightEra doesn't have the same margin issues as DayEra for me either. Much better on night era. Still a little bit harsh but I’ll switch over for now.